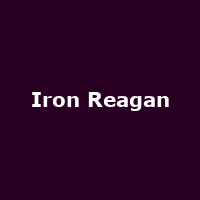 Iron Reagan are a punk-metal band formed in 2012, featuring members of Municipal Waste, Cannabis Corpse and Darkest Hour. The band features Tony Foresta - vocals, Landphil Hall - guitar, Mark Bronzino - guitar, Rob Skotis - bass and Ryan Parrish - drums. They released their debut album, "Worse Than Dead" in 2013, followed by: "The Tyranny of Will" (2014) and 2017's: "Crossover Ministry".